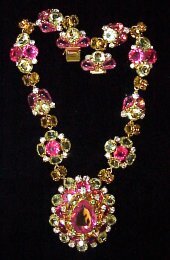 ValerieG specializes in unique and one-of-a-kind costume jewelry creations by leading contemporary American and French Designers. Highlights of our latest update include poured glass jewelry by Histoire de Verre, Venetian glass parures from Gian Paolo Maria, & fashion watches. Our L'Hoir Fuschia Galalith Necklace is featured in the new Estee Lauder lipstick collection. Robert Sorrell was named Designer of the 90's by Italian fashion magazine Gioelli e Bijoux. See our collection of his one-of-a-kind pieces.